On their debut album proper, New York City's French Kicks really take it back a few decades to get their interesting sound. With obvious nods to The Kinks, The Modern Lovers and The Cars, One Time Bells manages to somehow sound fresh and new. The majority of the record is some straightforward rock 'n' roll with all of the right pop sensibilities. The rough sound of their new home seeps all through the music as well. 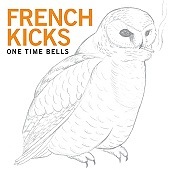 Just like how The Strokes album was NYC cool, French Kicks is the same, with a completely different sound. Vocalist duties are shared throughout, but there's never a moment where it's even remotely distinguishable. TRACK 7 creates a certain yearning to get up and dance, dance, dance, with its bouncey beat and trashy guitar licks. There are so many elements to this band, especially with their many interests. The use of piano makes a nice addition to the bass of Lawrence Stumpf, which is always pulsating to the fantastically creative beats conjured up by his brother Nick. A good example is TRACK 5, with its neo-soul falsettos "oohing" to the grooving rhythm section. Welcome to the next big thing.